Get Your Real Estate Salesperson’s License Guaranteed! Complete your required 40 hour course with us and we guarantee you will pass the state exam. If You Don’t Pass The MA Salesperson Exam On Your First Try You Are Welcome To Take Our Class Again For Free! Why Are We The Only Ones Making This Guarantee? Because we are confident in our teaching methods we know that you will pass. Not only will we teach you every concept that the test requires – we will drill you over and over again with test questions. You have a much better chance of passing the exam with our course. "Real estate questions and answers that easy to follow, and make sense." "Vast real world experience translated well to make good class room examples." "The book was very helpful in learning the material." "Useful insight from someone with experience." "It gives you real life experience from someone who has been there and done it." Step Two: You will receive an instant email confirming your date and time – pay in advance to reserve your seat, or pay in class with a check, card or cash. Step Three: Come to class. Salesperson class takes place over 2 weekends running 8am to 6pm both Saturday & Sunday in Woburn. Step Four: Upon completion you will receive a course certificate and stamp which fulfills your pre-licensing requirement. Now you can take the exam! Contact our office for one-on-one answers to your questions on course material. 1. Are You a Licensed Real Estate School In MA? 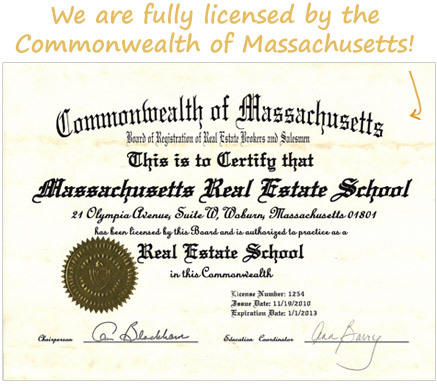 Yes, we are fully bonded and licensed in the State Of MA as a Real Estate School. 2. Is there a lunch or dinner break? Yes, we allow ample time for you to get food and there will be sufficient breaks throughout the day. 3. Are your classes fun? Yes!! We use lots of real life examples, and we make the course as interactive and fun as possible. The day will fly by.